When my husband invited me to accompany his Israeli high school students on a tour to Gamla, I assumed he meant the wine place. After all, the previous week the kids and I had tagged along on a school trip to the Miy Eden mineral water factory and the Golan Winery in Katzrin, so why not another beverage tour? There seemed to be a standard format - a detailed explanation (to be disrupted by my two-year old performing on stage along side the tour-guide and being asked to remove herself), a quick tour of a mostly mechanical process ("...and this robot takes a dozen bottles from the conveyor belt and puts them in the pre-assembled box, to be sealed by that machine over there and sent on to the crane, which you can see shrink-wrapping the boxes in cellophane and hoisting them onto the pile, which......."), and the piece de resistance, a tasting session (a quarter inch of organic grape juice, the kids being under-age). Miy Eden was rather more generous, for obvious reasons. There were water fountains situated every few meters, plus a small bottle to take away. So it was with no hesitation that I accepted the offer of a trip, merely asking if the school was promoting a Gourmet Month. "We're not visiting the Winery", my husband laughed, "we're going to the real thing - Gamla, the mountain, from where they got the name for the wine". "No problem!" I said, envisioning sweeping green slopes, lush enough to grow grapes on, and abysmally ignorant of the history of the place. The tour was scheduled for Friday morning - weather permitting - to be followed by a Yeshiva Shabbaton for all students and teachers and their families in Keshet Yonatan (an SPNI field center in a agricultural settlement). I turned out to be the only wife interested in shlepping two kids up a mountain with a bunch of teenage boys, but I took that in my stride. A friend had lent me a back-carrier for my younger daughter, Rachel Yonah, and I figured two-year-old Shira could walk, skip or run, depending on her mood. Friday morning the sun shone cheerfully - although after five and a half hours of very broken sleep (two small children don't lend themselves to a restful night) I wasn't quite as cheerful. I dressed two groggy kids and threw two playtex sippy cups (unavailable in Israel and therefore precious as gold), one security blanket, one doll named Allegra and another night-time security blanket into my travel bag. When I tried to fit the packed lunch in, I realized the bag was two small and so dumped the entire package, bag and all, into a larger bag. This time it fit. Another two minutes to collapse the travel cot and we were ready to leave. My husband had left earlier, with the rest of the luggage, to pray with the boys. Now Agrippa had united Sogana and Selucia by leagues to himself, at the very beginning of the revolt from the Romans; yet did not Gamala accede to them, but relied upon the difficulty of the place...for it was situated upon a rough ridge of mountain, with a kind of neck in the middle...in so much that it is like a camel in figure, from whence it is so named. It is always astonishing to me that we have a country so old, and so important that it is well-documented from the Bible onwards. Wherever you walk you are showered with information from the previous residents of distant generations. It makes you realize how much of a speck of time we inhabit, when someone from nearly two thousand years ago describes so accurately the self-same view you yourself are inspecting. As this city was naturally hard to be taken, so had Josephus, by building a wall about it, made it still stronger, as also by ditches and mines under ground. The people that were in it were made more bold by the nature of the place than the people of Jotapata had been, but it had much fewer fighting men in it: and they had such a confidence in the situation of the place, that they thought the enemy could not be too many for them; for the city had been filled with those who had fled to it for safety on account of its strength; on which account they had been able to resist those who Agrippa sent to besiege it for seven months together. I thought of Josephus, the Jewish traitor, who was so boastful of his achievements in fortifying the city under his leadership and protection, only to flee and become pragmatic eyewitness to its destruction. I wondered how the besieged Jews felt, perched high up in their nest, surrounded by the vultures. As Amos continued talking, I noticed Shira making a beeline for the edge of the cliff and leant forward to grab her collar and yank her back to my side, "Don't you dare move", I whispered at her. Not unnaturally, she began squirming and complaining and finally had to be bribed into silence with a stick of licorice. Meanwhile, Amos had described an attempt by the Romans to break into the city, beating down the walls with a battering ram, which the Jews had cleverly foiled by leading them into a narrow passageway and turning on them when there was no way for the Romans to back out. The people of Gamala supposed this to be an assistance afforded them by God, and without regarding what damage they suffered themselves, they pressed forward and thrust the enemy upon the tops of their houses. The buildings, built one-upon-the-other down the mountainside, collapsed from the weight of the soldiers, sending hundreds crashing down to their deaths. All in all it was a disastrous defeat and huge embarrassment for the "conquering forces". But now Vespasian, the Roman General, had even more reason to capture Gamla -, his pride. And the Jews were still stranded above the beautiful valley that stretched before me. I could almost see their figures, shadowed by the distance of time as they grappled with their dilemma. For the people of Gamala, it happened that they took courage for a little while upon such great and unaccountable success as they had. But when they considered with themselves that they had no hopes of any terms of accommodation, and reflecting upon it that they could not get away, and that their provisions began already to be short, they were exceedingly cast down, and their courage failed them; yet they did not neglect what might be for their preservation, so far as they were able....a great many of them fled out of the city through impracticable valleys, where no guards were placed, and also through subterranean caverns; whilst those that were afraid of being caught...and stayed in the city, perished for want of food. Amos had finished talking and we turned to begin our descent into the valley. The National Parks Committee had done an efficient job with the sign-posts to the various parts of the site, but they tended to detract from the natural isolation of Gamla. A tourist group passed us by, with video cameras and guidebooks, and disappeared down another path. We had asked another guide if the route we were following was suitable for kids, and he had answered yes so matter of factly that I felt silly to have mentioned it. But now that I saw the route I began to have my doubts. Essentially, we were lowering our way down a very steep, twisty, uneven flight of steps. My husband had no difficulty managing a bobbing baby on his back, but Shira had a disturbing tendency of lurching suddenly towards the edge, or scrambling too quickly over the rocks and slithering down a few more. My grip on her hand tightened and I began to wish I'd brought a safety harness for her. The high school boys agilely maneuvered their way around us and soon we found that we could see the whole group at the foot of the mountain, while we were still only half-way down. By the time we had finally caught up with the group, Amos had almost finished his description of the fall of Gamla, so I had my husband, who is more historically knowledgeable than I am, explain it to me at appropriate stopping points on our ascent up to the excavated ruins. Three soldiers had managed to get under a high tower and undermine it by removing some of the supporting stones. The sight and sound of its collapse threw the Jewish camp into fear and confusion, giving the Romans the opportunity to attack through the breach they had created in their first attempt. Titus, who was now returned, out of the indignation he had at the destruction the Romans had undergone while he was absent, took two hundred chosen horsemen and some footmen with him, and entered without noise into the city...as his entrance was presently known to those that were in the city, some of them caught hold of their children and their wives, and drew them after them, and fled away to the citadel, with lamentations and cries, while others of them went to meet Titus, and were killed presently. We had reached the summit. From here there was nowhere further to climb. I gratefully put Shira down and instructed her not to wander (not that she ever listens, but it's always worth a try). We sat on the craggy peak and surveyed the scene before us. The Kinneret was glittering through a gap in the mountains. It seemed so close as to be a short walk away (a deceptive vision that I experience daily from my living-room window in Tzefat), yet that would be impossible from this particular perch. The boys chatted and joked around, and a fellow-teacher took a photograph of us, since we had forgotten to bring our camera. Shira was now recovered from her arduous climb (I was not yet recovered from mine) and ready to try the descent. ...a great number of those that were surrounded on every side, and despaired of escaping, threw their children and their wives, and themselves, also down the precipices, into the valley beneath, which, near the citadel, had been dug hollow to a vast depth....the Romans slew but four thousand, whereas the number of those that had thrown themselves down was found to be five thousand: nor did anyone escape except two women...for otherwise they spared not so much as the infants, of whom many were flung down by them from the citadel. And thus was Gamala taken on the three and twentieth day of the month of ...Tishrei, whereas the city had first revolted on the four and twentieth day of the month of... Elul. We were on the way down; back to the bus, back to hot showers and Shabbat meals and comfortable beds. My husband still carried a sleeping Rachel Yonah in his back-carrier, and I helped Shira down the rocks, with a little assistance from the boys. A teacher ahead of us was explaining to a group of interested students the various intricacies of income-tax exemptions; a joker in the distance could be seen attempting to trip up his friend with a long branch. I remember, as a seminary student, climbing the infamous snake path up to Masada as dawn broke around me. I remember focusing on the beauty of the scene and the feeling of peace up there, despite awareness	of the great tragedy that had occurred. Now it was different. The scenario was very similar - an isolated group of brave Jews refusing to acquiesce to the might of the Romans, choosing to die instead - but the picture I saw, the story I understood, was a new one. 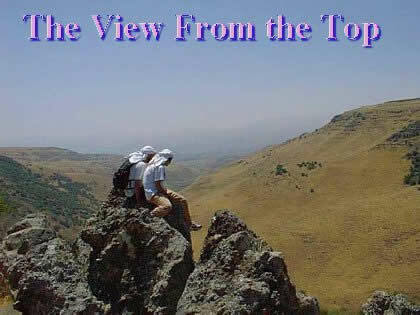 As a single youth, like the high school boys I was accompanying, I could only identify on a theoretical level with the courage these Jews displayed; but as a mother and wife attempting the climb with small children, I came closer to understanding the obstacles they faced. The distances that were too far for small legs to cover, the rocks that needed two hands to grasp - so how to keep hold of the child clinging to your side. My children had their sandwiches and no-spill sippy cups to sustain them, warm clothes and good shoes to protect them from the elements - these parents of Gamla had no way of saving their children from the mist and wind and Roman arrows. We were on a tour for "fun", they had climbed for their lives, and lost them. As we made our way down, saw the remains of the splendid shul that had once existed in Gamla, and started the climb back up to the parking lot, my mood lightened. 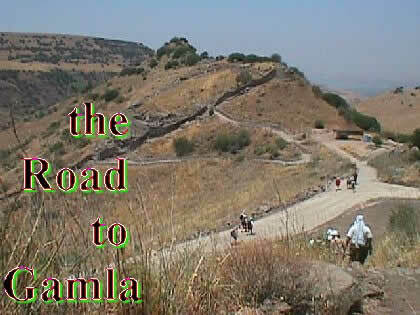 The same people who had laid the foundations for a synagogue that they knew (according to Amos) would only be completed in their children's or grand-children's lifetimes, would appreciate the fact that thousands of fellow Jews make the ascent to Gamla each year and remember their sacrifice. Especially the mother of a two year old, who was now growing weary and demanding to be carried. We bribed Shira with the promise of an ice-cream when she reached the top by herself. As she struggled up the last few steps, Shira crossed paths with a family with two older children debating whether or not to make the climb up to Gamla. Looking down at my little ginger-haired girl, the mother remarked, "If she can do it, so can we!" and off they went.